and playful dispositioned dog we could have ever hoped for. our little Ryley. I have already recommended you to several other families"
your lap! Sienna is also incredibly smart and loyal. every animal and person she has ever been in contact with. I can't imagine life without her! Thank you for breeding such a wonderful companion. I love the fact that you don't operate some big kennel and just produce puppies all year long. 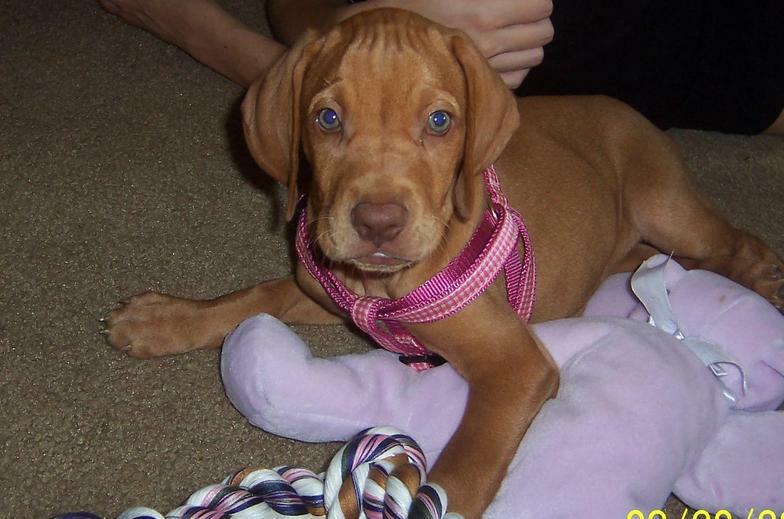 I think it shows that you take real time and attention when you do have a litter, to make sure that they get tons of attention and affection.I would recommend anybody looking for a Vizsla to contact you." letting us adopt our "firstborn" and adding so much life and love to our family." is going well for you! Thanks again!" 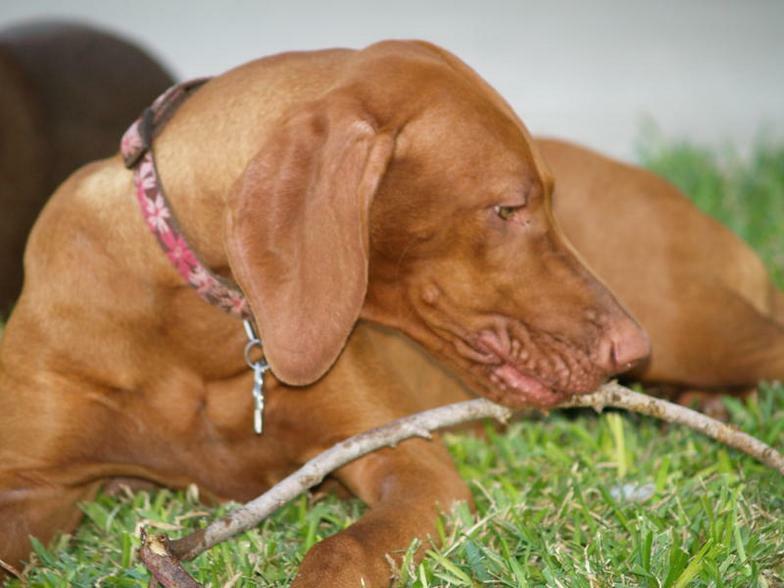 "Abby will be 3 on the 29th and has been an absolute joy to own. She has earned her JH and is almost broke for MH. Natural retriever and awesome field dog with moderate range. But, most importantly a sweetheart at home with babies, kids, and friends." amazing! Other people have mentioned that they are lapdogs. True! to be where people are. She is loyal and obeys commands every time. She has been easy to train and is a very gentle, excellent house dog. 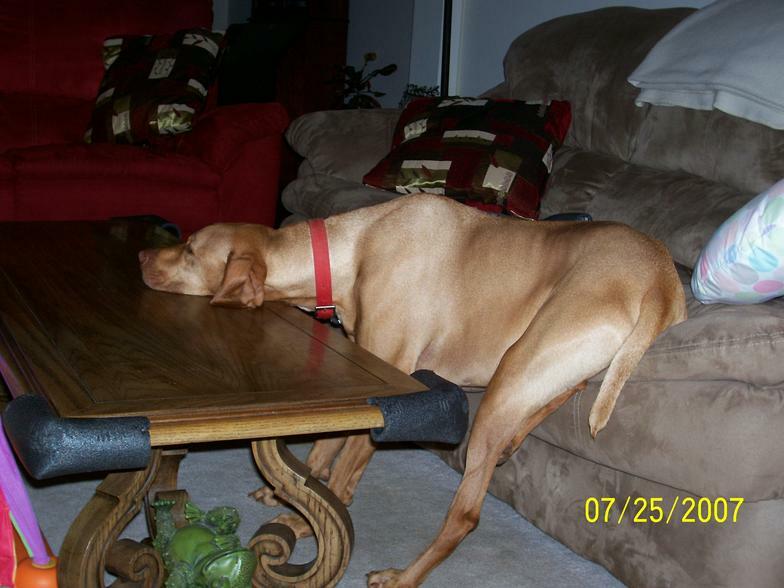 Thanks so much for raising such perfect dogs." "Reecie has turned out to be one of the most beautiful, healthy, friendly and active Viszlas we've ever known. We take her to doggie day care a couple times a week and the owner said to me a couple times that she's the most playful dog there, and that they put her in with a lot of new dogs to make them feel at home. 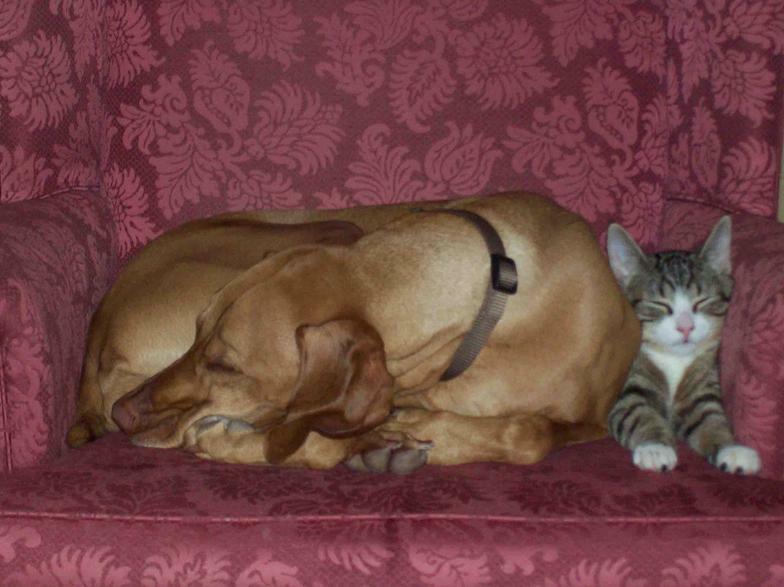 She's very outgoing with dogs and people, not agressive in the least, and hunts birds and rabbits like a machine. We've had her on LONG pheasant and quail hunts since she was 3 months old and one of her first times out she got 6 birds by herself. Absolutely no gun shyness or fear of loud noises. 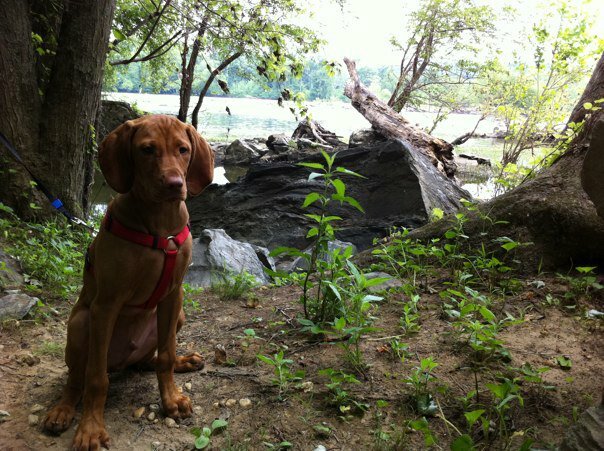 I highly recommend your Vizslas to anyone wanting a loving, energetic companion for outdoor pursuits, whether hiking, hunting or just exploring. And of course they MUST be able to sleep in your bed at least a couple times a week. We will definitely call you when we're ready for another one!" you for a wonderful dog!" 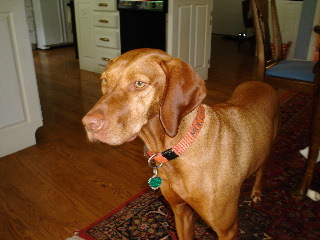 "Hi Nick, we have been more than happy with our Vizsla "Chase"! Here are some various photos attached taken through the years. I will forward some additional photos of her in action as a therapy dog. I have never had a dog that gets along with every dog/cat/hamster etc. smart as a whip, and a quick learner. I absolutely adore her!" "Nick, I can't tell you how much we have enjoyed Molly. protective of me, and best of all, a great lap dog. other dogs. My daughter has two dogs, both pound pups. fish. Molly jumps in off the dock trying to catch them! No luck so far. 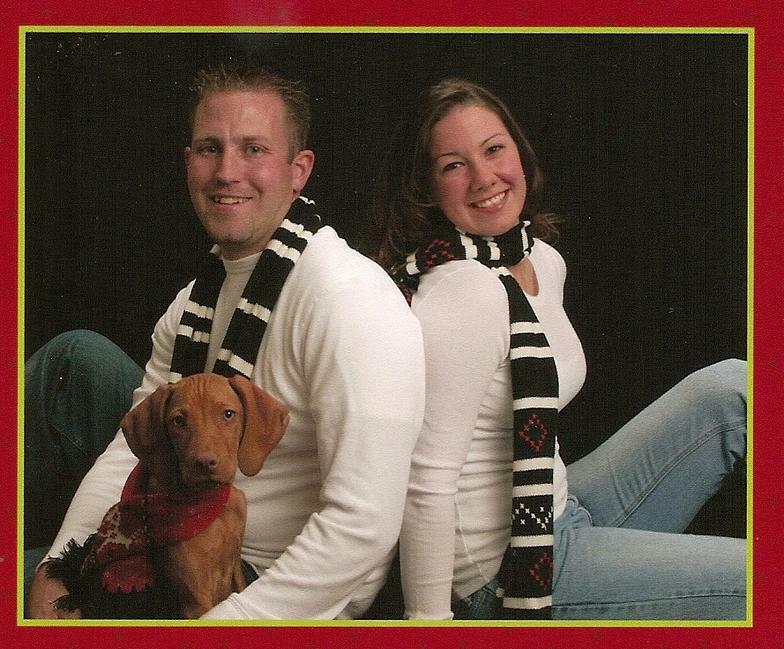 Best to you and your family"
we came across your kennel. Thank you!" 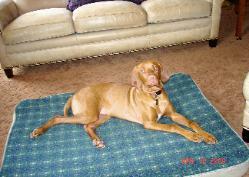 responds so well to obedience training." 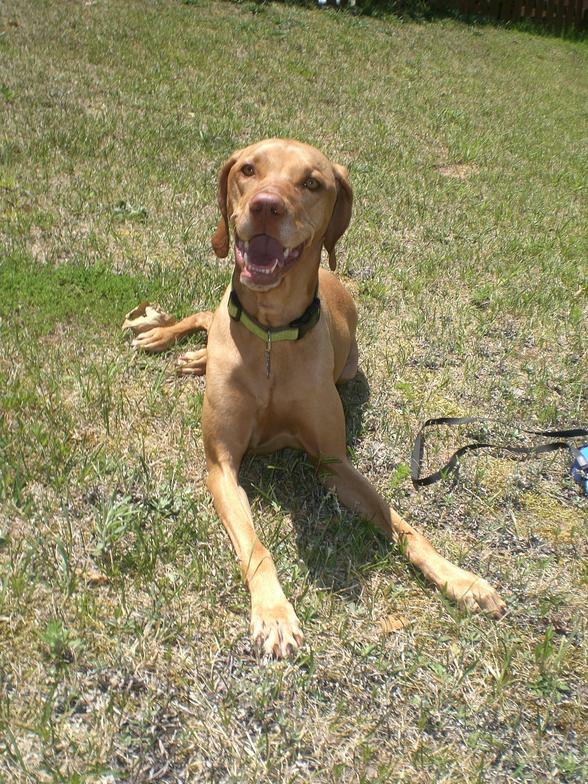 "​Nick: I wanted to tell you what an amazing dog Roux is and what a terrific addition she has been for our family. Terrific hunter, unbelievable companion, faithful friend (sleeps under the covers with my son jack every night with her head on her own pillow), runs 4-10 miles a day with me, feared by every squirrel in the neighborhood…she is as terrific a dog as we could have ever have hoped for. Every day my kids rush in from school to give her love and attention. I am hoping that my wife will soon let us get another pup from you. Many thanks." suppose to do in the field he is going to be really fun to hunt with. our new addition - I will keep you posted how he is coming along in the field." is an absolute love. He's definitely picked me as his favorite, and I'll take it! crazy about him yet...thank you for such a great dog! 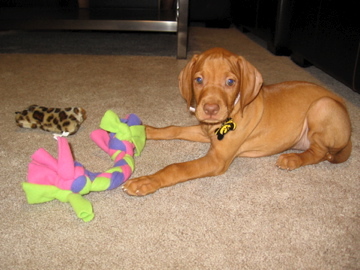 of Henry (AKC name Kentucky Statesman) at 16 weeks. He's growing up fast -- already 32 pounds of energy and happiness. Henry is a wonderful addition to our family!" and happy and everyone who sees her remarks on how beautiful she is. her the model at the vet's office because of her long legs. She is a joy.